A factory farm is a large, industrial operation that raises large numbers of animals for food. Over 95% of farm animals in the U.S. are raised in factory farms, which focus on profit and efficiency at the expense of animal welfare. Factory farms are often located in rural, disenfranchised communities, resulting in disproportional impacts on people of color. Physical alterations, like teeth-clipping or tail-docking, performed without anesthetic. Indoor confinement with poor air quality and unnatural light patterns. Inability to engage in natural behaviors. Breeding for fast growth or high yields of meat, milk and eggs that compromises animal welfare. Neglect of sick and suffering animals, often due to high ratio of animals to workers. Misuse of antibiotics to compensate for unsanitary conditions. Rough or abusive handling by workers. Packages of meat, eggs and dairy often bear terms that appear to indicate meaningful animal welfare standards, but only a fraction of them do. This confusion prevents conscientious consumers from voting with their wallets for better treatment of farm animals. Natural: Does not impact animal welfare in any way. Free-Range: No legal definition for use on eggs, pork, beef or dairy. Humanely Raised/Humanely Handled: Undefined and subjective terms without codified standards. Hormone-Free/No Hormones Added: Hormones are not approved by law for use on pigs or poultry, so the term is meaningless on those products. Cage-Free: On eggs, this label indicates that hens were not raised in battery cages. However, it is an empty claim on poultry meat as meat birds are very rarely raised in cages, and are instead crowded into large, open sheds. USDA Organic: This label has vague and poorly enforced regulations for animal rearing, and none at all for transport or slaughter. See here for more information. It’s important to understand the true meanings of food labels so you can make informed decisions and help animals by buying products that match your values. Learn more in our Meat, Eggs and Dairy Label Guide. While most Americans expect our laws to protect farm animals, the reality falls far short. Animals raised for food are among the least-protected class of animals in our nation. Although there are no federal laws protecting animals on farms, two federal laws cover farm animals during transport and slaughter. Tragically, these two laws exempt all poultry species, which make up 95% of land animals killed for food. Transport: The 28-Hour Law requires animals transported across state lines for slaughter— by means other than water or air—to be unloaded every 28 hours for rest, food and water. This law is weakened by loopholes, lack of enforcement and low fines. Slaughter: The Humane Methods of Livestock Slaughter Act requires that livestock be quickly rendered insensible to pain before being slaughtered. In addition to excluding poultry, the law exempts certain forms of religious slaughter, such as Kosher and Halal. Because federal law fails to protect most farm animals, state laws are these animals’ last defense. The majority of U.S. states expressly exempt farm animals, or certain standard farming practices, from their anti-cruelty provisions, making it nearly impossible to provide even meager protections. While in common industry use, these exempt farming practices are often shockingly cruel. Although a few states include farm animals in at least some of their anti-cruelty laws, such laws are rarely enforced in favor of farm animals. Ag-Gag: Over the past few years, "ag-gag," or anti-whistleblower bills, have been appearing in state legislatures across the country. While crafted to appear reasonable, these measures are designed to prevent the exposure of troubling practices at agricultural facilities. Instead of making it illegal to abuse animals, these laws make it illegal to document and report abuse. Learn where your state stands on ag-gag. Confinement Bans: On the bright side, an increasing number of states are banning certain extreme methods of confinement, such as battery cages for hens and gestation crates for pigs. Learn where your state stands on confinement. Right to Farm: Rather than reform destructive practices, corporate agribusiness is responding by pushing "Right to Farm" (RTF) laws that greatly limit the ability of states to regulate conditions on farms, including the cruel confinement of farm animals. Learn more about Right to Farm laws. Animals are not the only ones suffering because of these unnatural, inhumane conditions. Human health, the environment and farmers are being hurt by the intensive farming systems employed on factory farms. Human Health Farms that are not properly maintained can be breeding grounds for Salmonella, E. coli and other pathogens that can be passed to humans through meat, dairy and eggs, as well as through person-to-person contact. To combat unsanitary conditions, animals are fed large doses of antibiotics—but bacteria is constantly adapting and evolving. Misuse, overuse and dependence on antibiotics in our food system creates the potential for dangerous, drug-resistant strains of bacteria to develop and spread among people and animals. To learn more, visit endindustrialmeat.org. Environment Waste from large-scale confinement farms pollutes the water, land and air in neighboring communities, compromising both human health and quality of life. At the same time, these facilities consume massive quantities of precious, finite resources including water and fossil fuels. Family Farmers Corporatized, industrialized agriculture has largely wiped out America’s independent family farms—with catastrophic consequences. In 1950, there were 5.6 million farms and 100 million farm animals. In 2012, 2.1 million farms were raising 9.2 billion farm animals. With that many animals, the animal-to-caretaker ratio makes individualized animal care impossible. Further, contract-growing systems such as those found in integrated poultry production strip farmers of the autonomy to decide how farm animals should be raised and often keep farmers trapped in oppressive debt. Learn what the ASPCA is doing to help farm animals and why this issue impacts us all. Billions of animals raised for food suffer under inhumane conditions on industrial farms. We are animal people, so let’s stay true to our ideals when purchasing food. 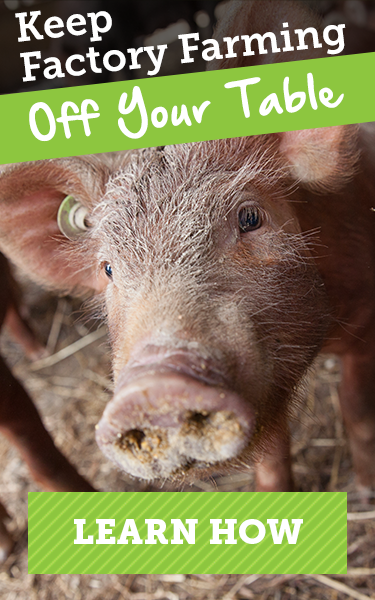 Shop with your heart to send the message that you care about the treatment of farm animals. Ag-gag laws pose a threat to a wide spectrum of values and issues Americans care about.